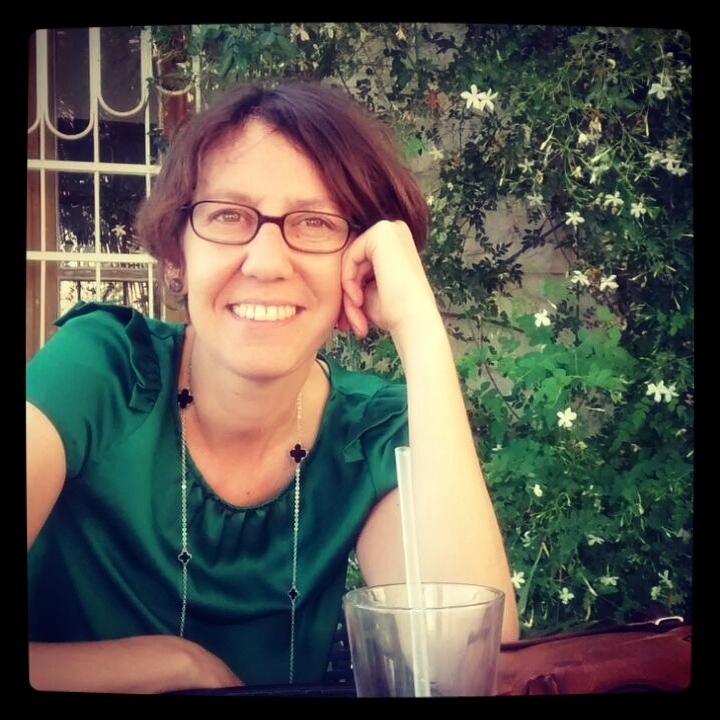 Nathalie Rosa Bucher is a features writer with a passion for cinema and cycling, a keen interest in culture and means of transport, as well as social and environmental subjects. Her mixed French-German origins possibly explain why she is drawn to divided countries and diverse societies: she called Cape Town in South Africa home for 15 years before coming to Beirut in early 2012. “Manal, is my neighbor in Sweida, my hometown [in southwestern Syria],” the 25-year-old artist elaborated. “We’ve known each other for a long time but this was the first time that I painted her. She is the only person with a physical or mental challenge around, and she is a bit overweight. Instead of concentrating on his graduation project, Braehe started painting Manal. Having failed to sketch her as she popped out of the bean field, brandishing her doll, he had waved at her, calling out: “Can I draw you?” Her response was an incredulous “Ani? ?” (Me??). “She was surprised, ‘Why me?’, she asked me. She was never given any attention.” But she came to his house, where Braehe did “Manal 1”, a 1.8m painting, very quick, in a very emotional, almost euphoric state. “She sat for me, the color of her skin was beautiful, and I was very happy.” The two had a chat; she said she was happy with the experience and his work, and left. 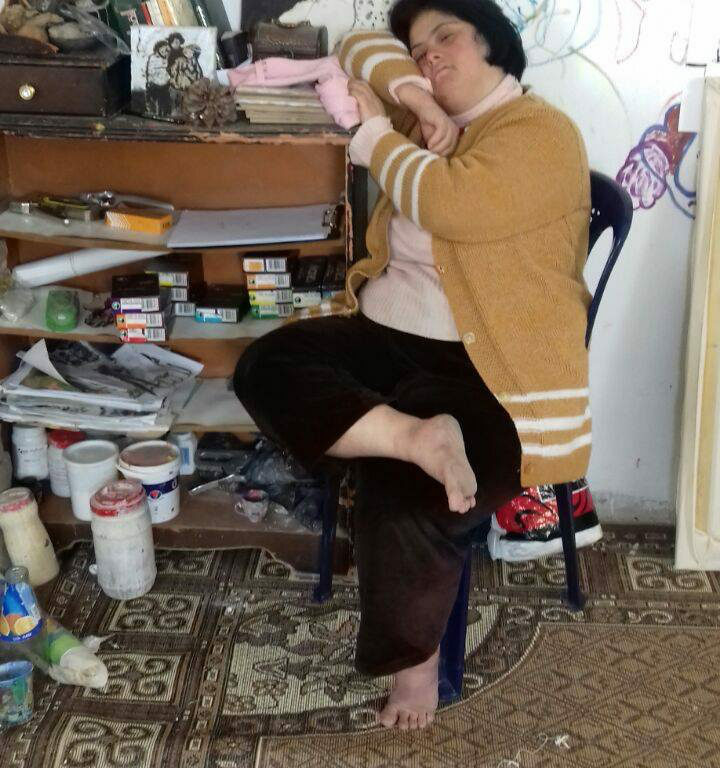 [Photo: Manal posing in Braehe's studio - Sweida - Syria - 2015-16 (Anas al-Braehe/Syria Untold)]. Manal started to change after several months, accelerated by the graduation show. “She became bolder, she started talking to people, she would gaze at her paintings for a long time. That’s when I felt that I was not just painting. I certainly felt a bit of a responsibility. “She is who she is, so when I paint her I would paint myself too somehow. From time to time she would resemble my mother, because she was so natural. All along, I felt free. We would talk and laugh and the poses would be very natural as a result,” Braehe pointed out. “Manal is circles, even her hair is round, she is very organic, and that is why I might add plates of fruit -- she is like fruit,” he explained. “Now that she has become a painting, people have changed their behavior,” Braehe said, noting that she previously faced much discrimination including children throwing stones at her. Her behavior changed too, according to the painter, when she is happy she even gets up and dances. “We hang out, I would tell her stories, she would tell me her dreams and I incorporated some of them in the paintings.” Her dreamscapes served as backdrops, which in “Manal and Umbrella” are captured in shy yellows and greens. [Image: A pensive muse in "Manal with Umbrella" (2016). Painted in Anas al-Braehe's studio in Sweida, this artwork purports to depict Manal's dreams (courtesy of Artspace Hamra - Beirut/All rights reserved to the author)]. Her face typically is bold, open, at times appears pondering, her head tilting to one side. Or half-hidden in the left corner of another canvas, again playing hide and seek. Her doll also features in some of the paintings and her clothes are without fail bright often featuring vivid patterns. “Once she suggested I paint her hair green and that is one of my best paintings.” “563 Road” -- in which Manal dons green hair, and wears a pearl wristband -- has a background kept in lush hues of blue and yellows. She would also probe the artist: “Am I pretty? Only beautiful women are painted.” Manal loves his work but sometimes she says: “I’m more beautiful” or asks: “Why are my eyebrows green?”, referring to Braehe's “Manal and Umbrella”. 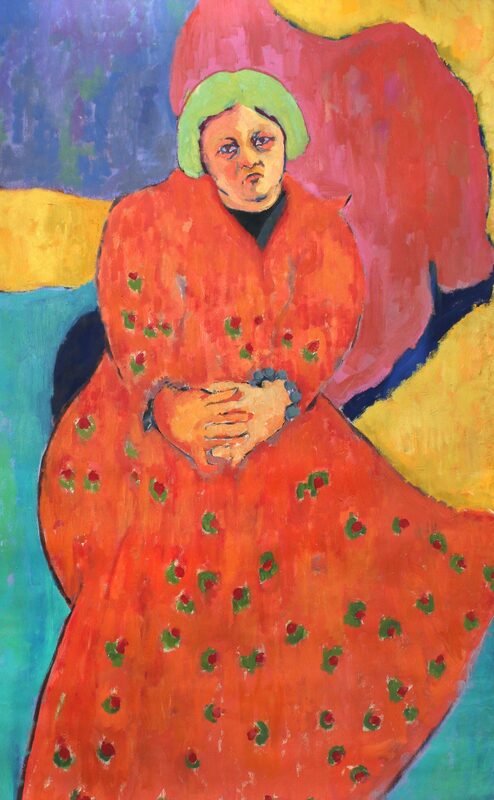 The rich, bold colors and Manal’s unreserved gaze and natural poses are reminiscent of German Expressionist painters, Gabriele Münter’s style and Paula Modersohn-Becker’s self-portraits but also Franz Marc’s blue horses, and Russian painter Alexej von Jawlensky. Wassily Kandinsky, one of their contemporaries, is a painter whom Braehe appreciates but, not surprisingly, he loves Matisse, the French painter famous for his use of color, most. [Image: Manal, seen with a road in the background, queried the artist Anas al-Braehe's choice of green hair, in "563 Road" (2014) (courtesy of Artspace Hamra - Beirut/All rights reserved to the author)]. Braehe is still searching for a source of inspiration in Beirut, but he already exhibited his work successfully in Tripoli’s Ahwak (“Immigrants Despite of Love”) in February 2016 and in two collective exhibitions at Albareh Art Gallery in Manama, Bahrain, in 2015 and 2016. A new MANAL exhibition is on at Wadi Finan Art Gallery (Amman, Jordan) from 13 May and runs until 25 May 2017. Braehe will exhibit a new body of work. 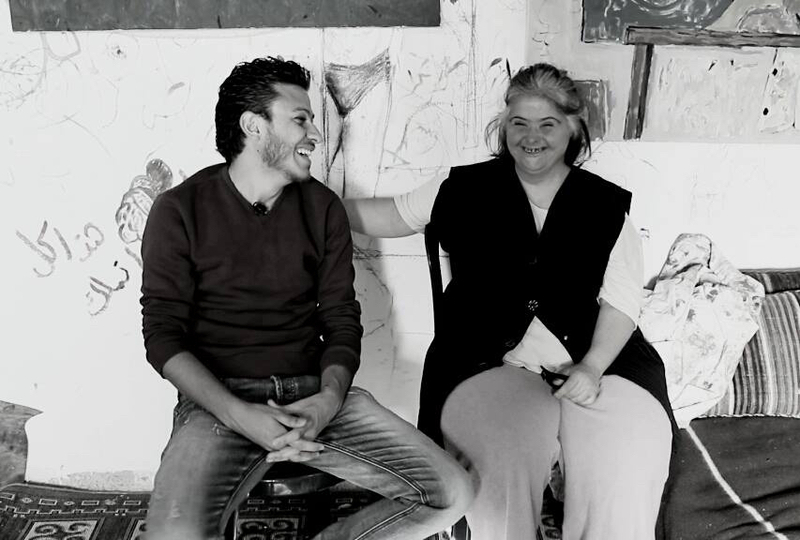 [Photo: Anas al-Braehe and his neighbor and muse, Manal, in the artist's studio - Sweida - Syria - 2015-16 (Anas Al Braehe/Syria Untold)]. 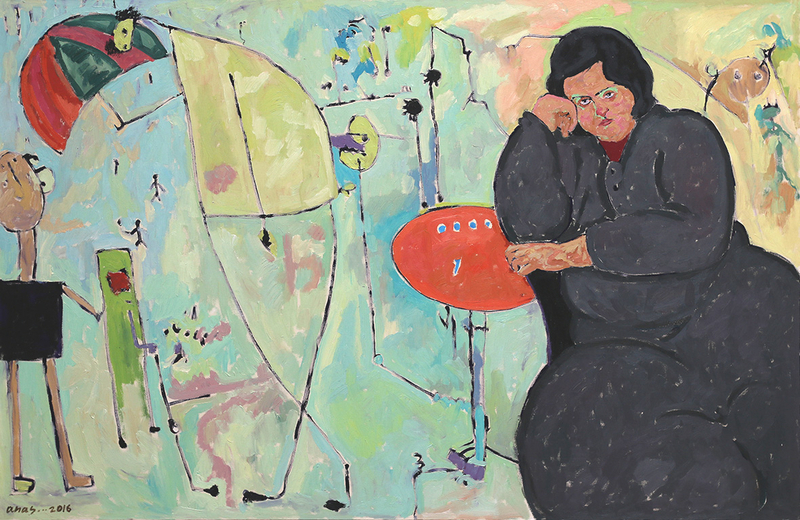 [Main image: A number of Anas al-Braehe's paintings incorporate Manal's dreamscapes. Depicted here is “The Yellow Dress” (2016), a large 120x180cm painting the artist made of his muse (courtesy of Artspace Hamra - Beirut/All rights reserved to the author)].